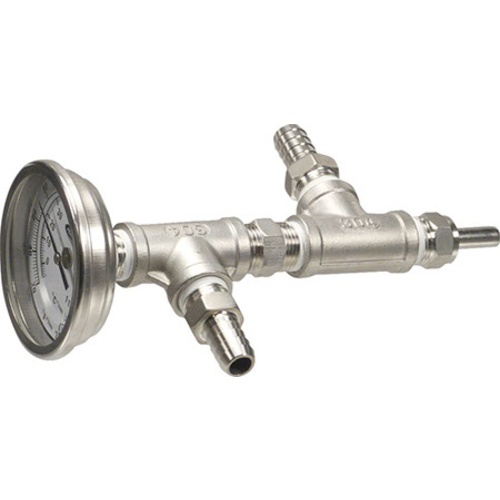 This completely stainless, inline oxygenation system injects oxygen into your wort as it travels from your wort chiller to fermenter and allows you to read the temperature coming out of your wort chiller at the same time. It has a 3" Dial Stainless thermometer and a 2 micron diffusion stone. The inlets and outlets are 1/2" barb. The oxygen inlet is 3/8". It is the economical alternative to our completely sanitary, stainless oxygen system, PRO30. The description mentions transferring half of the wort before adding oxygen. When you do start adding, how much do you add? Is there a recommended pressure or flow rate? BEST ANSWER: When you start adding oxygen maintain a pressure of about 6-8 psi. It doesn't take much, as the diffusion stone will do most of the work. Just what we needed, good product for the price, saved us a lot of effort a the time of oxigenation. What this is, its basically two stainless steel T's joined by a srew coupler, with the hose coulpers on their respective side, and on one end is the small hose coupler for the gas hose, which has the dufuser stone welded inside (you can unscrew for cleaning after use), and on the other end has the themometer, which is just a great feature to include right there. I have this in line before my chiller and it works great to get the o2 in! We built a 20 gallon brew system and included this as we exit the HERMS and pump into the building to the fermenter. The function is good although we had to relocate it into the building after the test run. The stone is now located above the fermentation area. This piece is a great tool .. But , the first time I used it in a test run of just water, the unit was not able to allow water to pass through. I took it apart to find that the oxygen stone was screwed in so far that the head was gground down from there not being enough room in the t- joint it is screwed into .. Creating no way for liquids to pass threw it .. I believe that a spacer is need to give you more flow .. I had to add a ?_ inch fpt to ?_ mpt adaptor . That seems to be the fix it needs other than that the unit is great and can easily be modified to fit your needs ..
Used this once so far. easy to reconfigure different parts to fit where you need. I turn oxygen on half way through filling fermenter. I purchased the unit without barbs, but the review would be the same. All in one solution for O2 and monitoring your wort temp out of the chiller. Slight ding on the design since difficult to remove the aeration stone for cleaning. Seems the design is for those with a pump to back flush to clean. So pick up a pump too! More Beer is the only place I have found with such a Great inline system. I run the wort through a Counterflow wort chiller and then to the in-line system. It reads the temp almost instantly and it is very visible when the oxygen is turned on. No need for a sight glass. This product is a real time saver. Great quality for the price!